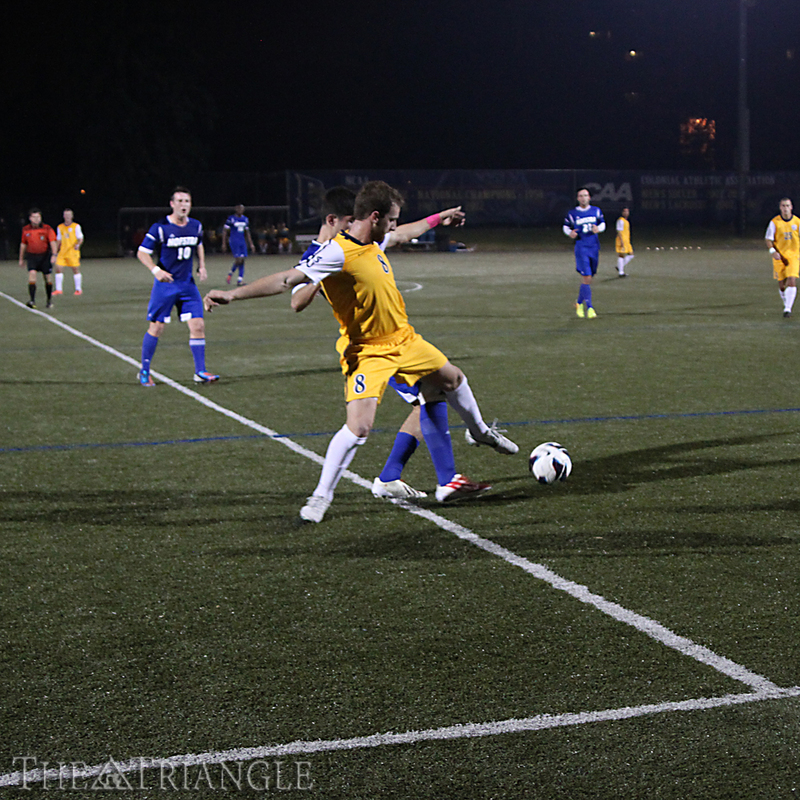 Midfielder Nathan page fights for possession during Drexel’s 1-1 draw against Hofstra University Oct. 30. The senior leads the Dragons with five goals this season. When senior night rolls around each year, the lights seem to shine a little brighter, the stage seems a little bigger, and the stakes seem a little higher. Of course, any Colonial Athletic Association match in late October or early November is important when a spot in the conference tournament is on the line. 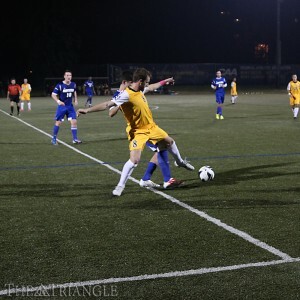 As for the members of the Drexel men’s soccer team, their sights are set on the top spot in the conference standings. On Senior Night Oct. 30, Drexel played Hofstra University to a 1-1 draw at Vidas Field to stay at the top of the CAA and clinch a spot in the conference tournament. The University of Delaware’s win over The College of William & Mary helped the Dragons to secure a spot in the final six. After the draw, Drexel is now atop the standings at 3-1-2, one point ahead of Northeastern University, which sits at 3-1-1. The Dragons play their last game of the regular season Nov. 4 at the College of Charleston, which is currently 1-3-1 in conference play. Against Hofstra, the Dragons came out of the gates flat. The offense could not create any momentum, and the defense allowed a goal to Elliott Firth on a corner kick assisted by Chris Griebsch late in the first half, which gave the Pride a 1-0 advantage. Whether it was the pressure of staying on top of the conference or the emotions of Senior Night, nobody can say for sure. However, head coach Doug Hess said that he believed it may have been a combination of both. Senior midfielder Ken Tribbett also said that the emotions might have gotten the best of them in the first half. For the second half of play, it was like a switch had been flipped. The Dragons got back to playing the brand of soccer that they knew how to play. They settled their nerves. Even still, Drexel could not find a way to put the ball in the back of the net. Drexel was able to keep the energy up and move the ball around. When they were awarded a corner kick late in the half, the Dragons jumped on the opportunity. They had questioned themselves, but they found the answer with a goal from senior Tal Bublil off of a set piece from the corner. The equalizing goal was assisted by Tribbett and junior Connor Goldsmith. The Dragons were able to get one more chance with a shot on goal before the end of regulation, but the game went to overtime, still tied at 1-1 after the failed opportunity. Heading into overtime, the Dragons were able to mount an attack in the Hofstra zone. Ultimately, they came up empty-handed after the 10 minutes of extra time. After a scoreless second overtime, the game ended in a draw. A win against Hofstra would have put Drexel in the driver’s seat for the top spot, but the one point earned in the draw will help to keep them in the conversation. The Dragons anxiously await the result of Northeastern’s Nov. 2 match against the College of Charleston. An upset by Charleston would keep Drexel’s name at the top of the conference going into the final week of play. Depending on their finish in the conference, it is possible that the Dragons could play another home game at Vidas before it is all said and done. The opportunity to play in front of the home crowd again would mean a lot to the senior class. After all, they have been a part of a major cultural change in the program’s four years under Hess. Last season, the Dragons earned their first NCAA Tournament berth in 40 years with an at-large bid. This season, they are in a position to get another bid as CAA champions. They are also in a position to continue changing the sports culture at Drexel University, thanks in large part to the group of nine graduating men’s soccer seniors who were honored Wednesday night.